Translator’s Note: This is an English translation of two original Chinese texts – text no. 1 is entitled ‘毛主席为什么口说皈依人不动？’, rendered as ‘Mao Zedong Asks Why is it that Religious People do not Change?’ – whilst text no. 2 is entitled ‘周恩来皈依虚云老和尚’ and translates as ‘Zhou Enlai – Disciple of the Old Monk Xu Yun’. The first title - Mao Zedong Asks Why is it that Religious People do not Change - seems to have a double meaning, and refers to the fact that those who follow superstitious religion are difficult to influence away from this limited thinking, whilst truly great spiritual beings – such as Master Xu Yun (1840-1959) - remain centred, balanced and psychologically and spiritually ‘pure’ regardless of the chaos around them. Mao wishes to reform the former, but emulate the latter, because he sees the positive and progressive effect Master Xu Yun has had on one of his closest colleagues and fellow revolutionaries – Zhou Enlai. As Mao was a very well read scholar of classical literature, he was very interested in Master Xu Yun, who seemed to be a Sage-like being from an earlier age, living in contemporary China. As Buddhism is a science and not a religion, Mao interprets its ‘liberation’ philosophy of the individual, as being compatible with the collective ‘liberation’ ideology of Marxist-Leninism. Mao states that the ‘collective’ (or ‘class’) is comprised of individuals that must free themselves as well as each other. The second text - Zhou Enlai – Disciple of the Old Monk Xu Yun’ – again assesses the relation between Xu Yun, Zhou Enlai and Mao Zedong, and provides the academic reference for this work (Buddhist Culture Study – Paper No.41). According to Master Xu Yun’s biography - he visited Beijing twice after 1949 in an official capacity. In 1952/53 (when Xu Yun was 113 years old) the government sent four telegrams to the Yunmen Temple in Guangdong province, requesting his presence in Beijing. This was for a gathering of Buddhist organisations to discuss the re-forming of a national Buddhist organisation. 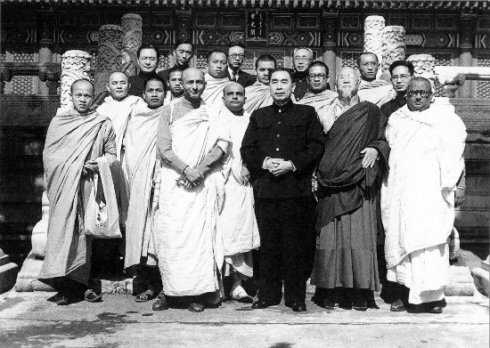 Then, in 1953/54 (when Xu Yun was 114 years old), he again travelled to Beijing to take part in the inaugural meeting of the newly formed Chinese Buddhism Association. In fact Xu Yun was regularly invited to Beijing by the government throughout the 1950’s, but declined many requests on the grounds of ill-health and old age. The following conversation between Mao and Zhou is not clearly dated – but the author of text no.1 - (newspaper reporter Feng Huangbo) mentions as part of Mao’s narrative, the situation in 1954/55 (when Xu Yun was 115 years old) which saw hundreds of people seeking ordination from Xu Yun, gathering on Mount Yunju – but the authorities were concerned about the conditions in China and the behaviour of a number of religious organisations at the time. However, Xu Yun promised to transmit the Vinaya Discipline to these people – but urged everyone to return home with precise instructions of what to do on a specific date and time. On this date and time, Xu Yun transmitted the Vinaya Discipline ‘at a distance’. This would suggest that this conversation took place around the mid-1950’s. A civilian who was a National Model Worker and Party Secretary eventually entered the ‘Spirit Rock Temple’ (灵岩寺 – Ling Yan Si) – (this temple is located in Dayu County, Jiangxi province) – and became a deputy head monk named ‘Law Safety Dharma Master’ (法安法师 – Fa An Fa Shi) – (this person participated in the Huai-Hai Campaign, and after Liberation, he worked in the uranium mines which were administered by the nuclear industry. He was then a Party Branch Secretary, and Mine Foreman. Due to his efforts, he was named National Model Worker, and Model Worker-Scholar. Later, he was promoted to Deputy Party Secretary, and Deputy Mine Manager and diligently worked on, eventually reaching the rank of Deputy Director Level until retirement, only afterwards becoming a monk). This person stated that Li Xiannian (李先念) took Refuge in the Triple Gem at the ‘Little Forest Temple’ (少林寺 – Shao Lin Si), and Liu Shaoqi (刘少奇) took Refuge in the Triple Gem on Mount Potalaka (菩陀山 – Pu Tuo Shan), and this revealed important information about Zhou Enlai (周恩来) and his association with Buddhism. Today, the facts concerning a conversation between Chairman Mao Zedong and Premier Zhou Enlai in Wuhan concerning the great Ch’an Buddhist monk – Xu Yun (1840-1959) can be told. Mao asked Zhou: ‘You have a very profound method of bringing harmony to any situation, how do you do this, what is your secret method or magic formula?’ Zhou replied: ‘Mr President, I always use Marxist-Leninism, but also Buddhism – sometimes a mixture of the two – this is the secret.’ Zhou further explained that he regularly studied the Diamond Sutra, and upon hearing this, Mao (understanding that Zhou was a Buddhist) asked him who his Buddhist master was. Zhou Enlai replied: ‘It is venerable old Master Xu Yun.’ Mao said: ‘Tell me more about this venerable old monk Xu Yun.’ Zhou replied: ‘Xu Yun is a contemporary Buddhist monk and his father was the Prefect of Quanzhou. His father and uncle both raised him as a son, and therefore two wives were chosen for him. However, before these marriages took place, Xu Yun fled to the hills to become monk. He was so poor that he had to eat plants and leaves to survive. He showed such endurance and forbearance that no ordinary person could have survived….’ When Mao heard this, he said that such an ancient as Xu Yun should come to Beijing because as a Dharma Raja, with spiritual power far greater than any worldly king. Mao said that he would like to become a disciple of Xu Yun – and if Xu Yun could not come north, perhaps Mao could go south and try to find him. Chairman Mao then said that when he was a child in Hunan province, his mother (who was a devout Buddhist) had taken him to a temple to worship the stone statue of Guanyin – the Goddess of Mercy. His mother was afraid because she had lost two previous children who had died, and she wanted Guanyin to become Mao’s foster mother. Zhou then explained that the venerable old monk Xu Yun was not only very old – but also well-known for keeping the Vinaya Discipline and never deviating from it. He was universally admired throughout China, and was renowned for correctly conveying the Vinaya Discipline when there was people to ordain. It was well-known that Xu Yun had thoroughly uprooted the three taints of greed, hatred, and delusion. Surely Xu Yun sets a good example for the nation? Not long after the Liberation, when there was much chaos in China, Master Xu Yun – then living on Mount Yunju - organised a mass Buddhist Ordination ceremony ‘at a distance’. He did this by writing down the instructions that people living far away from him had to follow at a certain time, and on a specific date. This is how he transmitted the Vinaya Discipline without being ‘face to face’ with his disciples. Mao was considering going south to find Master Xu Yun – or was looking for a good reason for Master Xu Yun to travel north to see him. Considering the many responsibilities Mao had running the country, and Xu Yun had ensuring the survival of Buddhism in the modern age, was this meeting possible? Mao publically stated that the teachings of the Buddha were very popular amongst the masses because people wanted liberation from suffering – and that Communism also existed for the liberation of the masses – who as the working class, were historically exploited. He said that there was a unity of purpose between Buddhist philosophy and Communist ideology. He also jokingly said that a person named Zhao Piaochu (赵朴初)* was also not Zhao Piaochu – and therefore the people are both real and existent, and also empty and non-existent. This was an allusion to the Buddhist principle of the integration of form and void, and the Marxist-Leninist theory of historical materialism – where all objects or things concretely exist, and due to the unstable nature of phenomena, also possess the ability to pass out of observable existence. This accommodation of apparently polar opposites may be confusing to an unprepared mind, but it is true nonetheless. Mao further explained that although the two pathways seemed different, they were actually compatible. This was like the different regional cultures and languages in different parts of China – they are all different, but essentially variants of a theme. It did not matter where a person came from, what clothes they wore, or what they drank or ate. It is the same between Communism and Buddhism – the goal of liberation is exactly the same – the methods are distinct but not incompatible. There is much negative propaganda (generated in the West and elsewhere) that states that Mao was intolerant to traditional culture in general and Buddhism in particular. This is historically untrue. Mao was very concerned about the welfare of the people, and interested in Buddhism – not as a religion, but as a philosophical science of mind development and optimisation. Throughout Chinese history it is obvious that spiritual systems and political thought go hand in hand, and that to separate them leads to a great disaster. Mao Zedong was a great statesman, politician, thinker, revolutionary, and an appreciator of classical literature and culture. He was a great military strategist, and highly effective Communist Party leader. He was also a great romantic poet and an extremely accomplished philosopher. He was an expert in military, economic, philosophical and religious history, as well respecting and extolling the value of education amongst the people. He remains one of the greatest 20th century’s political thinkers.